Not too long ago I introduced you to the Fingerlings family. And I'm back today to introduce you to FINGERLINGS MINIS. They are brand new Fingerlings friends that will be hitting store shelves across the country soon. The cute collectibles come in blind bags featuring one mini character, a bracelet and a charm. The mini monkeys, sloths, unicorns, and glitter monkeys even double as pencil toppers. Open the bag to reveal your surprise -- your character could be popular, rare, exotic, or ultra-rare! And if that wasn't enough I also have some more fun for you. I also want to let you know about the new Fingerlings YouTube channel that just launched. Fans can watch three fun and wacky shows featuring their favorite Fingerlings characters. New episodes air every week! FINGERLINGS TALES is a short-form animated series that follows the hilarious adventures of Bella, Boris, Gigi, Marge and friends as they navigate the waters of friendship and family in their hometown of Melody Village. A mix of wild wackiness and classic heart, the program reflects the creativity, originality, and laughter of the toy line. Boris and Bella host THE FINGERLINGS SHOW, a unique weekly live action variety show starring all your favorite Fingerlings toys - and some you haven't met yet! Filled with color and trademark Fingerlings wackiness, each episode features dance parties, pop culture parodies, open mic comedy at the Banana Shack, and hilarious skits. Gigi the Unicorn hosts HANGIN' WITH GIGI, a weekly video conference interview featuring top toy online influencers. 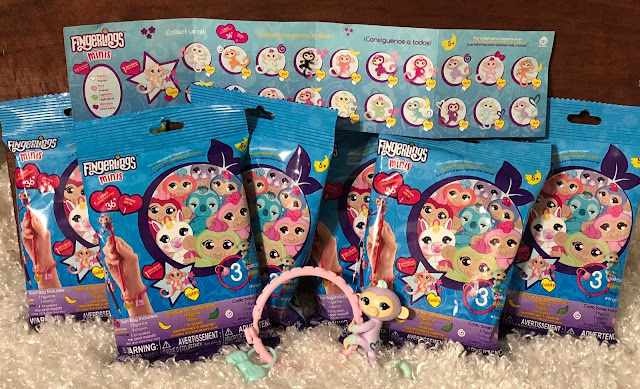 Sweet, sparkly, and fun, each episodes lets viewers learn a bit more about their favorite YouTube personalities and their love of the Fingerlings brand.